Last we wrote about Brodacom in January this year, it had emerged that Kingdom Bank had secured an order to acquire Brodacom’s assets over an unpaid debt. Kingdom Bank was apparently keen to recover a $20 million loan from Valley Technologies. 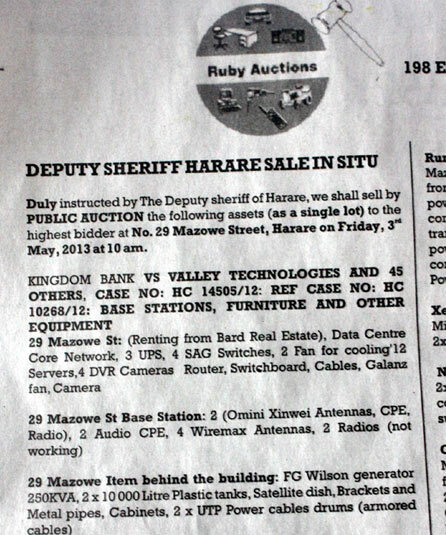 The matter re-emerged last week with a public notice in the local press announcing that the company‘s assets will basically be under the hammer this Friday as a result of the Kingdom vs Valley dispute. Brodacom the company is actually actively providing services, and sources tell us internet services will likely continue uninterrupted as the intention is to sell “the whole thing” in its working state. Hence the “as a single lot” bold text in the notice. The whole thing may (we’re just not sure) therefore just mean that Brodacom is under the hammer. A source also told us the move to put Brodacom’s assets under the hammer may be a clever way out of dealing with some unpaid liabilities of the company. An example being more than a year of unpaid salaries owed to employees. Note: the notice is in last Friday’s Herald on page C10. chikiribidi choga choga, there is no auction . who in their right senses wld buy a loss making concern? just doing away with creditors, period. Where is our regulator in this? They should come out and tell the public, users and business where all this mess is leading to, in a more official and position of authority. Can’t Kingdom Bank run Broadacom until they recoup their income and then sell it, this liquidation helps no one. The same worked with Lobel’s. The banks were owed huge amounts, they came together then they reinvested in new equipment, hired a new CEO and now Lobel’s is back on its feet the money is rolling in. They’ve made it clear that they are not interested in running a Bread company so they will sell their stake as soon as they recover their loans. That’s what we need I think! Vanhuwe haikonai kurarama patumafone twenyu musingavhunze zvirikutika.. Hudofo ihwohwo! Get a book on company law and banking regulations so you can see exactly the position ineKingdom and Valley. Ask yoself why Nigel akambopenga when he felt shot of his manliness with the Meikles deal..??? i wont say more.. The problem in my opinion is that Brodacom tried to invest in a chinese technology and failed dismally.. no one is going to purchase t-cdma equipment because no one else is using it here… besides even if kingdom purchases or takes over we as customers do not have faith in the business. It is true, but Kingdom bank won’t need to buy it first…. They own all that incorrect equipment already and like you say no one will buy it. The only choice is to convert that equipment into money some how, I can’t think of another way. those. Not really the best way to maximise value in their assets – but one assumes the creditors have lost patience. Check with regulator before bidding! Taura hako iwe, Nigel arikuda kutiza zvikwereti becoz clearly he took over from Zach now he wants to ditch all creditors yet he promised to pay. Kambavha! Where are the cars? Surely there must be a few executive cars around? No unsuccessful Zimbabwean company is short of the mandatory executive Benz or 50! Not suprising at all.Here is a company that started spending money before they even had one client on their network. Mr. Zachary Wazara, you’re a Bad CEO who Killed a good business..shame on you! if you are so keen to start a business then get advice and learn from those who are already in the field, Zimbabweans in the rush to get indigenuozation why don’t we think of others before involving them in your not so much long-term goals. So what happens to all the customers and where do we go from here? All offices are closed. How sad is this and very very frustrating!!! !